On the last day, Jesus will say to those on His right hand, "Come enter the Kingdom. For I was hungry and you gave me feed, I was thirsty and you gave me drink, I was sick and you visited me." Then Jesus will turn to those on His left hand and say, "Depart from me because I was hungry and you did not feed me, I was thirsty and you did not give me to drink, I was sick and you did not visit me." These will ask Him, "When did we see You hungry, or thirsty or sick and did not come to Your help?". And Jesus will answer then, "Whatever you neglected to do unto one of the least of these, you neglected to do unto Me!" As we have gathered here to pray together, I think it will be beautiful if we begin with a prayer that expresses very well what Jesus wants us to do for the least. St. Francis of Assisi understood very well these words of Jesus and His life is very well expressed by a prayer. And this prayer, which we say every day after Holy Communion, always surprises me very much, because it is very fitting for each one of us. And I always wonder whether 800 years ago when St. Francis lived, they had the same difficulties that we have today. I think that some of you already have this prayer of peace - so we will pray it together. Let us thank God for the opportunity He has given us today to have come here to pray together. We have come here especially to pray for peace, joy, and love. We are reminded that Jesus came to bring the good news to the poor. He had told us what is that good news when He said: "My peace I leave with you, My peace I give unto you." He came not to give the peace of the world which is only that we don't bother each other. He came to give the peace of heart which comes from loving - from doing good to others. And God loved the world so much that He gave His Son - it was a giving. God gave His son to the Virgin Mary, and what did she do with Him? As soon as Jesus came into Mary's life, immediately she went in hast to give that good news. And as she came into the house of her cousin, Elizabeth, Scripture tells us that the unborn child - the child in the womb of Elizabeth - leapt with joy. While still in the womb of Mary - Jesus brought peace to John the Baptist who leapt for joy in the womb of Elizabeth. And as if that were not enough, as if it were not enough that God the Son should become one of us and bring peace and joy while still in the womb of Mary, Jesus also died on the Cross to show that greater love. He died for you and for me, and for that leper and for that man dying of hunger and that naked person lying in the street, not only of Calcutta, but of Africa, and everywhere. Our Sisters serve these poor people in 105 countries throughout the world. Jesus insisted that we love one another as He loves each one of us. Jesus gave His life to love us and He tells us that we also have to give whatever it takes to do good to one another. And in the Gospel Jesus says very clearly: "Love as I have loved you." Jesus died on the Cross because that is what it took for Him to do good to us - to save us from our selfishness in sin. He gave up everything to do the Father's will - to show us that we too must be willing to give up everything to do God's will - to love one another as He loves each of us. That is why we too must give to each other until it hurts. It is not enough for us to say: "I love God," but I also have to love my neighbor. St. John says that you are a liar if you say you love God and you don't love your neighbor. How can you love God whom you do not see, if you do not love your neighbor whom you see, whom you touch, with whom you live? And so it is very important for us to realize that love, to be true, has to hurt. I must be willing to give whatever it takes not to harm other people and, in fact, to do good to them. This requires that I be willing to give until it hurts. Otherwise, there is no true love in me and I bring injustice, not peace, to those around me. It hurt Jesus to love us. We have been created in His image for greater things, to love and to be loved. We just "put on Christ" as Scripture tells us. And so, we have been created to love as He loves us. Jesus makes Himself the hungry one, the naked one, the homeless one, the unwanted one, and He says, "You did it unto Me." On the last day He will say to those on His right, "whatever you did to the least of these, you did to Me, and He will also say to those on His left, whatever you neglected to do for the least of these, you neglected to do it for Me." When He was dying on the Cross, Jesus said, "I thirst". Jesus is thirsting for our love, and this is the thirst of everyone, poor or rich alike. We all thirst for the love of others, that they will go out of their way to avoid harming us and to do good to us. This is the meaning of truest love, to give until it hurts. I can never forget the experience I had in visiting a home where they kept all these old parents of sons and daughters who had just put them into an institution and forgotten them - maybe. I saw that in that home these old people had everything - good food, comfortable place, television, everything, but everyone was looking toward the door. And I did not see a single one with a smile on the face. I turned to Sister and I asked: "Why do these people who have every comfort here, why are they all looking towards the door? Why are they not smiling?" I am so used to seeing the smiles on our people, even the dying ones smile. And Sister said: "This is the way it is nearly every day. They are expecting, they are hoping that a son or daughter will come to visit them. They are hurt because they are forgotten." And see, this neglect to love brings spiritual poverty. Maybe in our own family we have somebody who is feeling lonely, who is feeling sick, who is feeling worried. Are we there? Are we willing to give until it hurts in order to be with our families, or do we put our own interests first? These are the questions we must ask ourselves, especially as we begin this year of the family. We must remember that love begins at home and we must also remember that the future of humanity passes through the family. 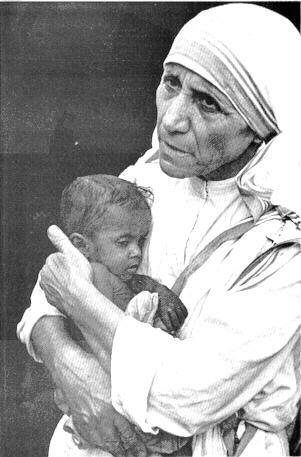 The Ninan family has been privileged to have known Mother Teresa intimately. We met Mother in 1978 when she arrived in Sanaa, Yemen Arab Republic to start her homes. I was at that time working in the University of Sanaa and worked closely in the establishing of the homes in Yemen. Mother had been a constant visitor to our home whenever she visited Yemen. Since then our family had come to know her intimately and had come to love her. Our children still cherish her involvement in their life, the token gifts of love and the entry she made in our family guest book. 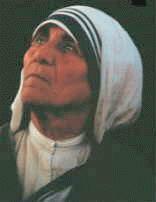 Once she surprised everybody when she took her crucifix pin and gave it as a birthday gift to our youngest son Ajit. No part of this website may be retrieved and stored in any media – digital, hard copy or otherwise – without the expressed permission of the author, unless otherwise specified in the context.